Diners hold a unique status to New Yorkers. They are usually the final destination of a wild night out, or the primary destination the morning after after that wild night out. And in a city filled with endless dining options, why would one opt to go to a diner? Well, there is something incredibly comforting about them – it’s a place of familiar foods, unpretentious vibes, and friendly prices. Upon entry into the Nickel & Diner, the space boasts expansive windows that attract abundant natural light. There is ample seating for every kind of group – booths on one side, countertop seating on the other, and table seating in the back. The front section of the restaurant includes a café serving local coffee and pastries complete with round marble-top tables and even more natural light, the perfect recipe for an over-the-top Instagram photo. 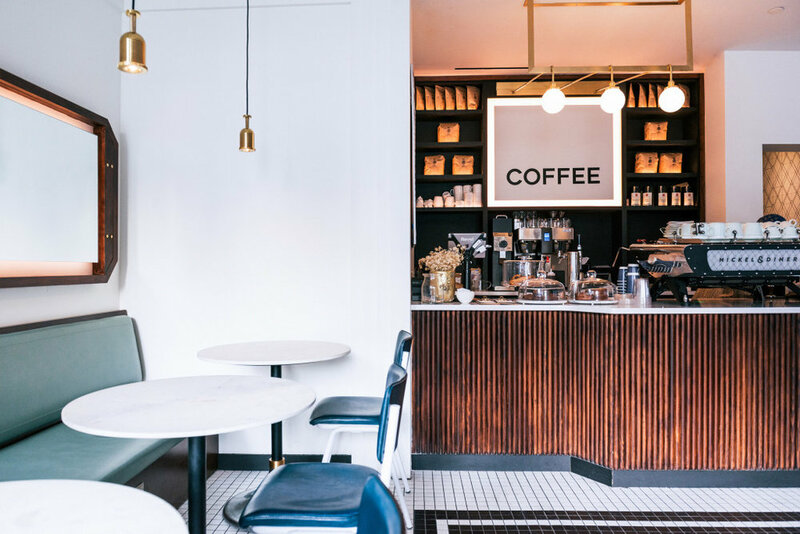 Everything from the diner’s white tiles to their dark wood accents to their retro lighting fixtures give the place a sleek, modern look, unconventional to traditional diners. The owners of Nickel & Diner, Jonathan Chu and Selwyn Chan, own neighboring spot Chikarashi, one of NYC’s first purveyors of the ultra-trendy poke bowl. If you have been to Chikarashi, you know that they are serious about perfecting the quality of their food. They have brought Chef James Friedberg, formerly of Blenheim and Le Cirque, to put a spin on classic breakfast dishes using the best ingredients the city has to offer. Everything is sourced locally from neighborhood markets, paying homage to the dynamic neighborhoods of Chinatown and Little Italy. In this way, Nickel & Diner is both a diner and a market-to-table American restaurant. My guest and I shared the pancakes, huevos rancheros omelet, and potato hash. The pancakes were studded with macadamia nuts and topped with sea salt. Though more flat than fluffy, they were delicious. The omelet featured a tangy sauce at its center and came with a salad that perfectly complemented its flavors. I have my eyes set on their egg sandwich for my next visit, which includes everything you need in a complete breakfast—eggs, meat, and cheese—all on a poppy seed roll. Though I have yet to try their lunch and dinner, based on my breakfast experience alone, Nickel & Diner will surely be a hit. Diners need not be the site of unhealthy, grease-laden food that we’re often ashamed to admit we ate. Nickel & Diner has successfully proven that.